Did observer coverage change, indicating changes in quality of fishery data? Short Answer: Yes. 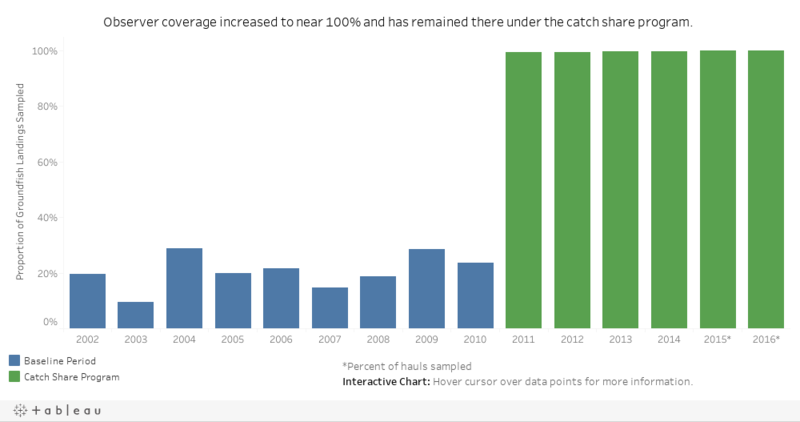 After the catch share program began, observer coverage increased fivefold to nearly 100 percent, indicating improved data quality. In the five years before the catch share program, onboard observers monitored an average of 20.5% of landings. In the first six years of the catch share program, onboard observers monitored an average of 99.6% of landings. This indicator measures the percentage of catches that are observed by third-party individuals on fishing vessels. In the years before the catch share program, onboard observers monitored between 9% and 28% of total landings in the fishery. From 2006 to 2010, the average onboard observer coverage was 20.5% of landings. Third-party onboard observers are an important source of fishery data because they provide reliable estimates of discards and total catches for all species caught in fishing vessels’ gear, as well as data on non-target species that are discarded (Discards Indicator). Prior to the catch share program, the fishery management council reported considerable delays in the delivery of data, which resulted in information about catches for each stock being unavailable for more than a year after the fishing season ended. Full observer coverage is a core element of the catch share program because proper implementation of catch shares requires an accurate accounting of all catches (Squires et al. 1998). All vessels participating in the West Coast groundfish catch share program are required to carry at-sea observers for total catch verification, meaning that 100 percent of the groundfish caught in each haul are documented. Observers are also required to monitor the sorting, weighing, and discarding of catch. Since 2011, 99.5% of total landings have been fully monitored by observers. Fully monitored means that catches of all species, including those not managed as part of this fishery, were monitored and data were successfully recorded. For 2015 and 2016, data on the monitored percentage of total landings was not available, but 99.8% of hauls were fully monitored. The comparison between baseline and catch share periods may be confounded by differences in vessels participating in the pre-catch share and catch share periods. That is, our analysis compares the observer coverage between the pre-catch share limited-entry trawl vessels and a subset of those vessels that are in the catch share program. Squires D., H.F. Campbell, S. Cunningham, C. Dewees, R.Q. Grafton, S.F. Herrick, J. Kirkley, S. Pascoe, K. Salvanes, B. Shallard, B. Turris, and N. Vestergaard. 1998. Individual transferable quotas in multispecies fisheries. Marine Policy 22:135–159. Somers, K.A., Y.-W. Lee, J. Jannot, V. Tuttle, and J. McVeigh. 2016. Estimated discard and catch of groundfish species in the 2015 U.S. west coast fisheries. NOAA National Marine Fisheries Service, Northwest Fisheries Science Center Observer Program, Seattle, WA. Somers, K.A., J. Jannot, N.B. Riley, V. Tuttle, and J. McVeigh. 2017. Estimated discard and catch of groundfish species in the 2016 U.S. west coast fisheries. NOAA National Marine Fisheries Service, Northwest Fisheries Science Center Observer Program, Seattle, WA. © 2018 MRAG Americas, Inc. All Rights Reserved.